Upgrading the floors in your home or business is a major long-term decision, so it’s important to know that you’re making the best choice when it comes to your investment. Renovating your interior space is simple when you begin from the ground up with one of the many styles of hardwood floors in Sherman Oaks, CA, we carry in our showroom. In addition we offer professional hardwood floor repairs and refinishing. With the help of our friendly and knowledgeable specialists, you’ll be sure to find a flooring option that matches your taste while remaining comfortably within the budget you’ve set for your project. Our flooring store has developed a positive reputation in the community and been recognized among local flooring shoppers as the premier destination for stunning solid hardwood flooring. After we’ve helped you to find a new hardwood floor, installation from our experts is available to ensure that your new floor will be perfectly fitted in your residential or commercial space. Our extensive installation experience with a broad range of wood flooring has given us the expertise that you can depend on for your next flooring makeover project. When you’re ready to update the look of your interior décor, reach out to our team of flooring professionals for more information about the products and installation services that we offer. When you visit our showroom to begin shopping for your new solid hardwood flooring, you’ll discover a wide range of affordable styles from name-brand manufacturers. We carry numerous options in a variety of species, sizes, and finishes, which gives you the opportunity to choose a pattern that works best for your design vision. 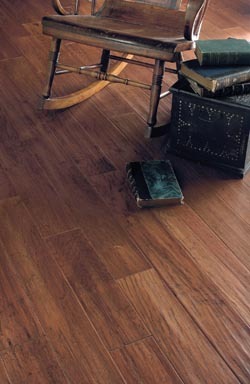 Hardwood is known for bringing a timeless and distinguished appeal that refines any space where it is installed. A new hardwood floor immediately makes any room look significantly more elegant and enhances its overall appearance and value. Whether you’re interested in a rustic look or a more modern aesthetic, you can depend on our flooring options like laminate flooring or carpet to deliver exactly what you have in mind for your space. Our access to a broad array of affordable floors ensures that you’ll find some of the lowest hardwood flooring prices in the area when you visit our store. With a new cost-effective floor from our showroom, you’ll be able to significantly increase the worth of your property without spending more than you intended for your project. In the event that an accident damages your hardwood floor, repairs from our crew of professionals will make your floor look and perform just as it did before the damage occurred. We specialize in restoring the quality of floors that have received any type of damage, no matter how complex or simple it may be. If you currently have hardwood floors in your home or business, then you’re already aware of how wonderful they are. With help from our hardwood floor refinishing contractor, your floor’s natural beauty can be restored to its former glory. Our hardwood floor refinishing service makes your floors look as beautiful as they were when you first purchased them, so you’ll be able to enjoy the look of a new floor without the cost of purchasing one. Contact our hardwood flooring specialists when you want the perfect hardwood floor for your home. Our team assists customers throughout Sherman Oaks, Studio City, Valley Village, Hollywood, and Bel Air, California, as well as the surrounding areas.